In a nutshell, our Amortization Calculator helps you determine what you will pay - and when - for your mortgage loan. 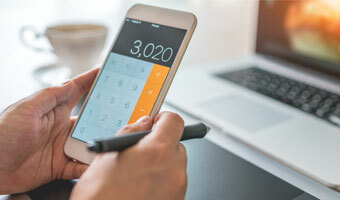 This simple loan calculator allows you to enter the loan amount, interest rate, and loan term, and shows you the estimated monthly payment and total interest to be paid over the length of the loan (fixed-rate or adjustable rate). You can use the Amortization Calculator to create a printable table for your loan - simply fill in the fields below and click "Calculate." Amortization is "the systematic repayment of a debt." The emphasis is on the word "systematic." Amortizing a mortgage loan means paying it down, bit by bit. Usually, this means making regular monthly payments. Pretty straightforward, right? The great advantage of utilizing an Amortization Calculator while searching for a home loan is you will know how much you must pay each month, under a specific interest rate, and get an idea of when you will finish paying off the loan. When you take out a mortgage, you make a monthly payment to the lender, and that is an amortization payment. A part of the payment covers the interest due on the loan, and the remainder of the payment goes to reduce the principal amount owed. Interest is computed on the current amount owed and will become progressively smaller as the principal is decreased. In the beginning, you will be making large interest payments and small payments to the principal. As time goes on, you will reduce the principal to the point you don't have much to pay in interest, and so your payment covers mostly the principal. Ready to buy a new home? Find a mortgage loan professional in your area for a free consultation. This calculator is for informational purposes only. Results are an approximation based on the information you enter. Please speak with a Waterstone Mortgage loan professional for specific information and current market conditions. Your monthly payment amount will be higher if an escrow account is established for taxes and insurance premiums.